Welcome to HAEL — the fast, furious, and fun fantasy world where the Orcs and Gnolls won the war – now adapted for the Savage Worlds rules. 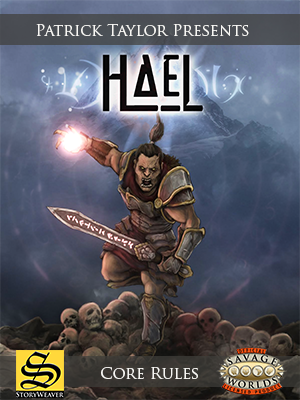 HAEL isn’t just another world – it’s a journey into the heart of war, ambition, and drama! On the way you will visit a sorcerous Dominion ruled by Daeorcs, the descendants of Orcs; an Empire where the Yaena, the children of the Gnolls, have perfected the arts; and a wilderness where the untamed Humans, Halflings, and Kirene endure a daily life-and-death struggle to survive. You will come to the Daeorc tower of High Sorcery, the great Storyteller Lairs of the south, and the desert plains where the Calling brings those who live in the wilderness to the power within themselves. The Strangers are here also, trying to escape their fate at the hands of the merciless, steel Nuclarine. New technology will merge with the power of magic and of the mind, and you will see a war brewed from the mix. HAEL takes several existing fantasy ideas that you know and love – Orcs, Gnolls, Humans, Halflings, and magic – and develops them to a degree that makes then new again. Stuff like the techniques of Daeorc Sorcerers; the martial arts styles of the ever-flexible Yaena warriors; and the guerrilla fighting tactics of Human barbarians with psychic powers. Speaking of psychic powers, Savage Worlds Edges have provided us with an even more streamlined and elegant set of rules than the popular d20 OGL ‘Psihammer’ rules, and we have added a real psychic-fantasy flavor with these Edges and Powers! Then HAEL takes off with a bunch of inspired and well defined new material – like the untamed Kirene and the blood-sacrifice rituals of their Druids; the mental powers of the Strangers; the awesome technology of the Nuclarine... the settings malevolent steel-gods! With all this going on something has got to give – and it does! You’ll be there on the brink for the second war of HAEL, as psychic barbarians, sophisticated Sorcerers, deadly Outriders, murderous Druids, and the Alien newcomers make and break alliances, trying to become the rulers of HAEL. HAEL is a layered and navigable PDF, best viewed in the latest version of Adobe Acrobat. Please Note: You will need a copy of the Savage Worlds Rules (Deluxe or Explorer) to fully use this product. Daeorcs, descendants of the orcs, rule the Dominion of the north. Yeana, children of the gnolls, control civilization in the south. Outlaw Humans, Kirene druids, and Halfling outriders live in the wasteland in-between. From the sky come two groups of strangers, bringing their war with them! Everything you need for a Fast, Furious, Fun Fantasy game set in Hael. Sorcery! Psychic powers! Blood Magic. And a rich world setting forged for epic adventures in a time of change.